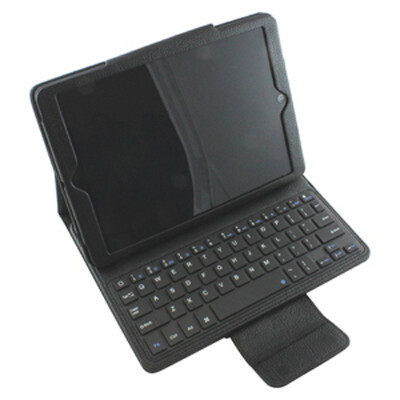 Features: PU Leather compendium with Bluetooth keyboard. The silicon keyboard design is silent, waterproof and offers an energy saving mode. The compendium includes built-in rechargeable Lithium battery, cable and instructions. (iPad not included). Certification: CE, FCC, RoHS. Product Colour: Black, White. Product Size: 250 x 200 x 30 mm. Print Area: 56 x 56 mm, 60 x 60 mm (front), 60 x 60 mm (rear). Print Process: Pad print, Debossed. Delivery: 3-5 weeks (indent by air) from art approval. Sea freight is available on 1000+ (POA). Standard Packaging: Gift Box. Packing Details: 20 pcs per carton, 15.5 Kgs, 38x31x45 cms. Setups: Included.